At the stroke of midnight on the eve of the 28th January, a Facebook reminder popped up on my phone’s notifications. It was a sweet little note that reminded me of my official four year anniversary with Conner. It’s oddly romantic that Facebook feels the need to remind me of one of the most important memories to date, it’s even cuter that it includes a few pictures and a heading wishing me a happy anniversary. But as the quote from one of my favourite Australian writers, Beau Taplin so eloquently states, a relationship should not be measured in the months or years or the amount of time one has spent with another. A relationship is measured by so much more than that. It’s about the impact they have on you as an individual and the impact they have on your life, the good, the bad and the damn right disastrous. Over the past four years, a lot of things have happened in my life. I’ve experienced some wonderful things, some horrible things and besides my best friends, the only really consistency I’ve had, is Conner. This time four years ago, Conner promised he would stick by me through anything, no matter what – and over the past four years, he’s been true to his word. Even when I’ve been the most impossible person to love – he’s stayed. Even when I’ve been adamant to push him away. It hasn’t been the easiest and I will not paint it so that our relationship is picture perfect and everything is fine. There’s been hardships, screaming matches, arguments that last for days. He moved away last year, whilst I was in my third year of University. He was on a work placement and it was one of the hardest times because I wanted him to be there when the workload would get too much or if I received a really great grade – I wanted to share it all with him, but he was 214 miles away and a phone call was not the same. But we worked through the distance, we worked through the constant missing each other’s calls (mainly him missing mine because he’s just terrible with phones.) and we made the best of the distance. Now, it’s January 2016 , four years since he asked me, like a true gentleman, to be his girlfriend. We’re currently living together for the first time, in a flat, finishing off our studies and dreaming of moving to London (I say dreaming, it’s more of a necessity.) The future is near, the future is far, but it seems for me at least, the future holds my relationship in sight. I cannot imagine my world without Conner. He’s become the biggest part of me. I cannot wait for where we go next. I cannot thank him enough for the past four years, making memories with me, inspiring me and encouraging me. And I cannot thank him enough for accepting me for all that I am and loving me for all that I am. It is truly a blessing to find someone who you want to know inside and out, someone who after four years, can still surprise you and make you feel like the luckiest girl in the world. He is my best friend, my partner in crime and this post is a thank you, to him, to acknowledge my love and to express my gratitude. May the future be as happy, wholesome and bright as the now. Happy Thursday, my dearest followers. Make sure to tell your friends, your loved ones and your family just how much they mean to you, every day; not just on special days. Now, without further ado, I have a dinner date with my beloved. See you later my little loves. Dear followers and adoring readers, I apologise for the long absence in blog posting. It’s been a busy few weeks in Georgia’s (that’s me in case you’ve forgotten!🙊) life. I’ve bagged myself a basic 9-5 job which is good enough for the time being, earning me some money to pay off my lovely student overdraft. To those out there who are still searching, don’t give up! You will find something. My job is pretty average, it has nothing to do with the degree I’ve worked towards for the last three years, but it’s a job at the end of the day – something I was in desperate need of. Now I’ve been there for three weeks, and I’ve met some lovely people and made new friends along the way. Speaking of the degree I’ve worked so hard for over the last three years, yesterday (9th of July) the official final award marks went live on our e-portal. And that is right girls and guys in the blogesphere. As of September 2015, I will be a graduate with a 2:1 Bachelor of Arts degree in English and Creative Writing 🎓🎉. And that is just the first steps of adulthood. 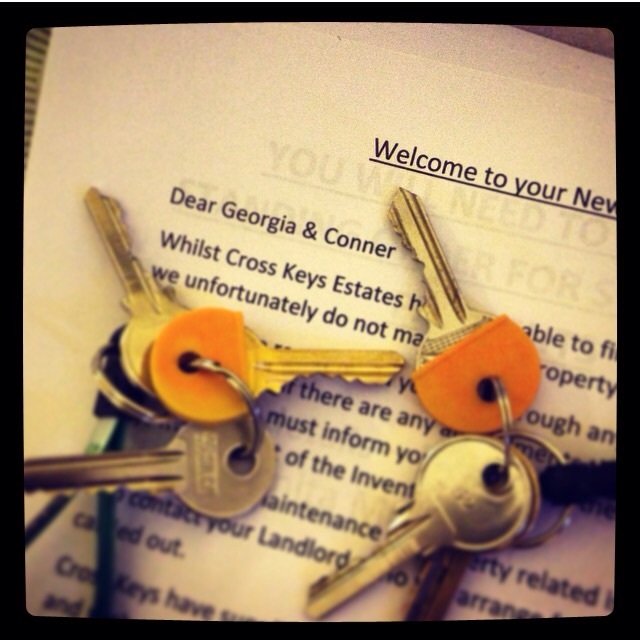 The main reason for this blog post, and for my timely absence, is because today is the day that my boyfriend and I have obtained our keys for our very own flat. That’s right, we are taking the next step and we’re moving in together. As Conner is staying in Plymouth for the next year, to complete his university degree, he asked me if I wanted to move in with him – and I didn’t hesitate in saying yes. I’ve spoken about him a lot on this blog, whether it’s in passing or if there is a entire post about him; living with him will really be one dream come true. I cannot wait for our adventures to start here. Now, it hasn’t been easy. House hunting, flat hunting, its all the same, and it’s all very stressful. What’s been even worse for us is that, we haven’t been able to do much of it together. As he’s in a different part of the county right now, it makes life that much harder. Our flat choice was made on a narrowed decision of flats we had seen separately, and the one we have chosen is one Conner himself, hasn’t seen in person. Which raises a lot of questions as to whether he will like it or not. Regardless of that fact, it doesn’t matter. Because we’re going to be living in it, together. It’s a very surreal feeling at the moment, moving in with your significant other is an extremely big moment in one’s life, and one’s relationship. We’re ready, and we’ve demonstrated living in close confidenment, but it still doesn’t stop me from being nervous, being excited, being extremely scared – what will the next year bring? The road leading to the flat secure was rocky, and never ending stress endured. But it’s done now. We’ve got ourselves a flat, and we’re starting a new adventure, together. It is one I cannot wait for. No matter what, it’s going to be extraordinary.